Image courtsey of Google Images. This is not a picture of Steve Day. For Steve Day, he knew his symptoms had proven that he had black lung. A common diagnosis for coal miners after years of working in the coal mines. Even some of the doctors said he had black lung, even the test results were showing that his severely impaired breathing was due to black lung. 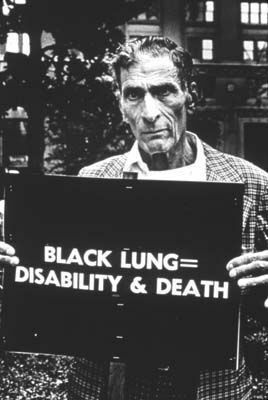 Even with a clear diagnosis of black lung, he was still denied benefits that would be paid to him from his employer for this diagnosis. His employer-- where he worked for many years-- fought hard and vigorously to avoid paying him benefits. This left him and his family barely able to get by and having to take loans from family members and even neighbors to stay afloat. Like most insurance companies, his employer used a unit of doctors from John's Hopkins Medical Institution-- their "go -to" place for coal companies. They wanted a negative X-ray reading to help them defeat benefits claims, reported Chris Hamby of Buzzfeed. The judge went with Dr. Paul Wheeler's testimony against Steve Day, as he has with many other cases before. When Steve Day's lungs gave out on July 26, the doctor who performed his autopsy found extensive black lung. His autopsy had been shared-- with the permission of his family-- by the reporter of the article with three doctors who specialized in black lung and other related diseases. They stated, "Steve had one of the most severe cases of black lung they had seen", indicating that a majority of his lung had been replaced with scar tissue that had coal dust. Dr. David Weissman, who heads a federal agency's division that certifies doctors-- including Wheeler-- to read chest X-rays, said it was "very concerning" that a certified reader would fail to recognize a case as severe as Steve's. When Dr. Wheeler had been asked to talk, he said. "I'd love to talk, but the hospital asked that everything be referred to the legal team." Of course everything has to be referred to the legal team. When the reporter got a hold of the hospital, there wasn't much they could say except that the reading done by Dr. Wheeler had been suspended. But even with the new evidence of the severe black lung in Steve Day, there is still no say in whether they will take it into consideration. We see stuff like this all the time. Companies working hard to avoid paying benefits to employees who clearly deserve them under our legal system. And in this case, apparently going as far as using a doctor who will falsely claim that the patient does not have black lung, when there is clear evidence that he does. And these insurance medical examiners pull this stuff all the time, so if you've been scheduled for an "independent medical exam" by an insurance company, make sure you knwo what you're up against. And if you have a serious injury, where you can't work, need surgery or other medical treatment and think it may be permanent, Do NOT do this alone. Call us at (202) 393 - 3320. Even if we don't take your case, we can help you avoid making mistakes that may cost you thousands of dollars, prevent you from seeing the doctor you want and getting the medical care you need. And for more information on this story, follow this link.